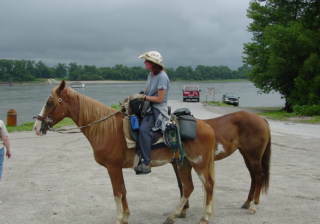 In March, Linda Losey began her journey along the 5,000 mile-long, coast-to-coast American Discovery Trail on horseback. The expedition is a memorial ride for her youngest son, 10 year old Sam, who died on June 22, 2004, in a tragic family accident. 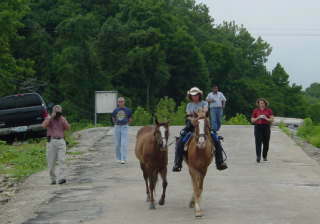 Linda is accompanied by Val, a horse which had been abused, and Rocky, a Tennessee Walking Horse. 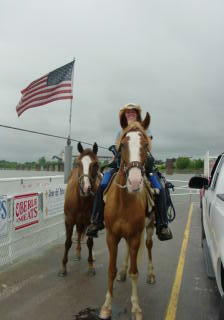 Before they set off, Linda was helped and encouraged by several Members of The Long Riders' Guild. The team has travelled for more than a thousand miles, so now Linda herself is a Member of The Guild! "I just returned from 2 days in St. Louis, MO with Linda. It was incredible. She was radiant, the horses looked fabulous, and truly seem to love their adventure. Val gave me a big hug when she saw me (I took care of her for 2 years) but what an incredible bond they have with Linda. I met her on the road with a saddle, we loaded her packs into my friend's car. Linda and I then rode the last few miles together. I can't believe the difference in the horses from before their journey. Rocky (whom I rode) was instantaneously responsive to my voice and signals. My friend is a horseback riding instructor in St. Louis and had made arrangements for a 'Meet and Greet' that evening at the farm where the horses were staying. After a 10 hour day riding and caring for the horses, Linda spent 2 hours with a girl scout troop (who had an equestrian team) explaining her ride, how she leaned heavily on the expertise from the Long Rider's Guild, how she rode, what she carried, problems she'd encountered, care of the horses, ...etc. At 10:00 pm, with teary good byes, the Girl scouts and parents left. Linda never turns down the chance to educate others about the ride, horses, and rescues. It's amazing." 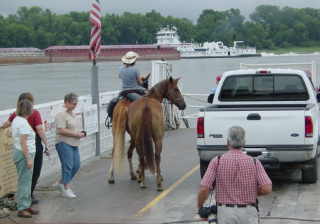 Linda Velben has sent another message and some photographs of Linda and the team crossing the Mississippi - by ferry! Click on any of the images below to enlarge these lovely pictures, which were taken by Larry Hurlbert of Union, MO. Crossing rivers is always worrying for Long Riders, because by definition there is no shoulder. There are usually impatient motorists, too. Taking the ferry, as Linda has proved, is much safer! As can be seen from these pictures, Linda's horses are in excellent condition. We understand that Rocky has put on 140 pounds, which is a great testament to Linda's care. Linda and the team are in Indiana. Rocky had an infection, and was cared for by some wonderful people in the Shawnee National Forest while he recovered. Linda and Val carried on alone for a while. They have just been reunited and everything is going fine. 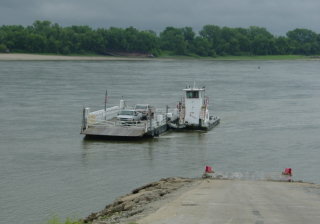 Linda told The Guild, "Missouri was tough as far as the roads are concerned!" Please click here to go to Linda's website for more information and a map.